Williams Digital pianos have crafted a name for themselves in the category of versatile, low-price digital pianos, by offering musicians and music enthusiasts a perfect balance of the look, feel, and sound of an acoustic piano along with the amazing range of features that only a digital piano can offer. In this article we’re reviewing the Williams Allegro 2. 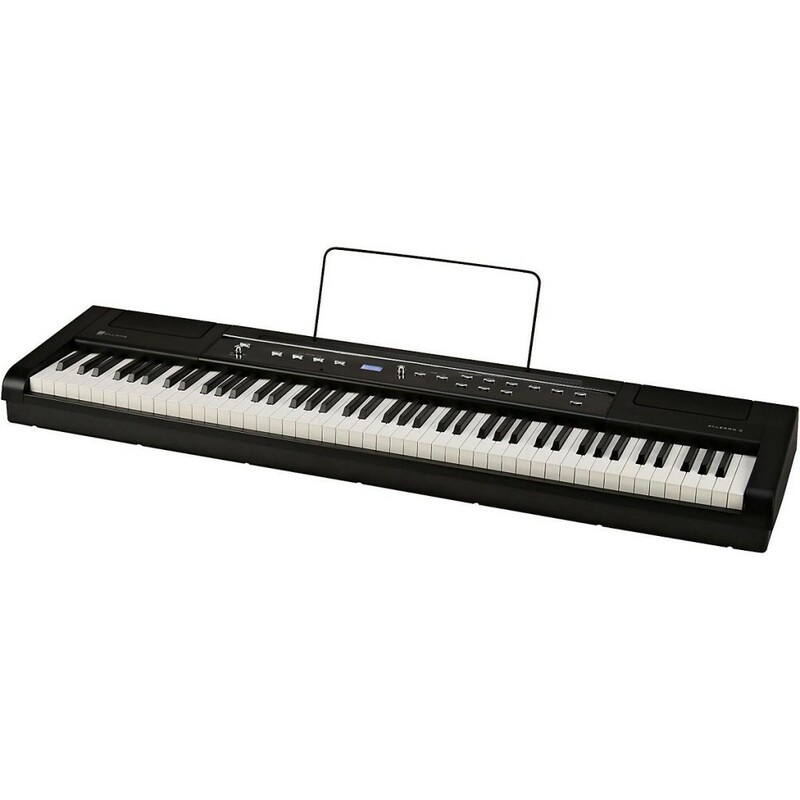 The company has now announce their latest model, Williams Allegro 2 88-key digital piano, which follows closely in the tradition of its predecessor Williams Allegro at a very affordable price of $299.99 only. But in its endeavor to sell low-price pianos, has Williams compromised with the features and overall sound quality of Williams Allegro 2? Let’s find out! The new Williams Allegro 2 is a full-sized digital piano, which boasts of an extremely realistic piano feel thanks to its weighted 88-hammer action, full sized keys and yet manages to avoid any compromises being made to its compactness or portability features. Being battery powered and highly portable, at a very affordable price, the Williams Allegro 2 becomes a perfect choice for students, small bands, home entertainment, schools and churches. Its realistic action and impressive sounds make it an excellent musical instrument to play, irrespective of genres, whether it is classical, pop, rock or jazz music. Loaded with a brilliant new custom sound library, the Williams Allegro 2 also offers 10 sound samples including classical and modern pianos as well as electronic keyboards and synths. These sound samples include a beautiful stereo, 10′ 2″ concert grand with stereo velocity samples. Other notable sounds include electric pianos, along with strings, synthesisers and bass. The Williams Allegro 2 is able to satisfy a wide variety of musical needs, thanks to its split and layer functions which allows to combine the various sounds in the desired manner. The Allegro 2 offers a new MODFX feature which provides real time control of the rotary speaker effect and a vibrato effect for electric pianos, in addition to outstanding reverb and chorus effects. This additional feature plus the hammer-action keys, the custom sound library, split and layer functions, all combined together allow the player to have more explicit control over the internal sounds than any other digital piano in its class. On further use, the Williams Allegro 2 proves itself to be a complete musical instrument for keyboard players. It boasts of inbuilt speakers, stereo, 1/4 inch audio outs for connection to any audio system, a headphone jack (which was missing in the previous Allegro model), an automatic sensing sustain-pedal, a music stand and even a metronome! It can also be used as MIDI controller and has the ability to connect to a computer using a USB port for recording to any standard MIDI application. With easy to navigate controls and the graphic LCD display, the Allegro 2 proves to be quite easy to read and adjust the settings accordingly. The versatility of Allegro 2 doesn’t end here, you have the option to run it on batteries or use an optional AC power supply! The newer Williams Allegro 2 has new features and upgrades added over those of the earlier Allegro model. The new Allegro 2 introduces the option of USB connectivity which allows it to connect any computer, along with a new MOD/FX control option which allows for a greater control over the internal sounds. There are also an additional two sound samples in the Allegro 2 and built-in speakers, which were missing in the previous model. Allegro 2 has a headphone output, which enables the player to practice at home without any background / outdoor noise interfering with his practice as well as without anyone else at home getting disturbed. 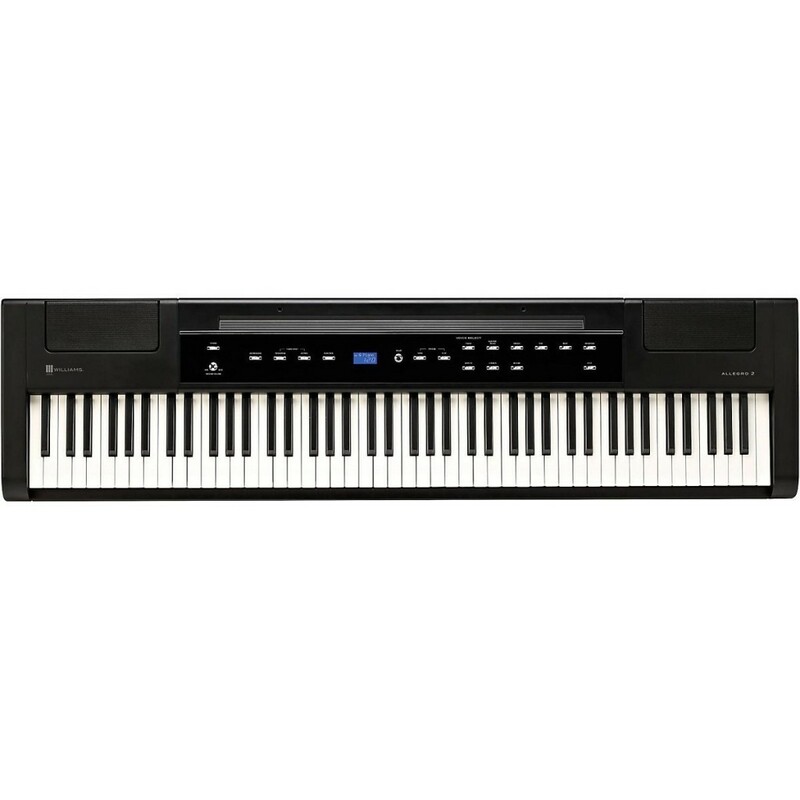 There is a slight increase over the price of the earlier Allegro model, but even then at $299.99, the Allegro 2 remains one of the most efficient digital pianos in this price range. There is a notable improvement over the overall build and quality of sound in the Allegro 2 too, and combined with the other minor upgrades and additions at a slightly higher price, the Allegro 2 turns out to be a more capable product than its predecessor. With its quality construction, realistic piano touch, fresh sounds and plethora of features, the Allegro 2 remains a terrific value-for-money product and scores much higher than its contemporaries in the same price range. Its affordability and portability, along with its easy to use features, make it an ideal musical instrument for piano enthusiasts, beginners, students, churches and small bands. But if you are expecting a piano which matches the sound quality of much more expensive ones, these are not the ones you are looking for.